Is Your Brand in the Hands of Consumers? Are you looking to put your brand in the hands of more consumers? Are you looking for new ways to make your brand top-of-mind when consumers attend sporting events? The Washington Wizards found a unique way to do this by featuring AOL branded beers in the AOL Executive Suite at the Verizon Center. The picture on the right of the AOL branded beerwas taken at a Wizards game in 2007 when the the team hosted the Detroit Pistons. This creative branding tactic opens up a variety of sponsorship ideas within the realm of sports. 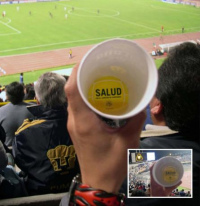 Branding cups (especially in the suite/100 levels) for specific fans/consumers is a new inventory piece that teams can sell to supporting partners. While this may not appeal to some brands (e.g. automobile partners), others may love the fact that they can have their logo in the hands of consumers consistently throughout the duration of a sporting event. Are Your Gift Card Sales Down?